Remember my friend, Mike, and his mom, Ellie? I hope so, because this story is NOT about him! (In case, you don't remember him, click here for a visit.) You'll meet most of the critters they have. I say most because he's gotten more that I'll be telling you about soon I'm sure! Well...on Sunday Mike sent me an email and in it was this picture, taken this past Saturday, when Mike went outside to feed everyone. There was something new! He just kept saying "Oh, my" over and over again! Well, as the story goes, according to Mike, Texas Pete (a donkey) was had his you know what snipped last year. Apparently, he "got to" Mini Pearl somewhere before, after, during...who knows. The funny thing was, that Mike just thought Mini Pearl had gained some weight and didn't even realize she was expecting! You go girl!!! Leave it to us women to keep our shapes even when we're pregnant! Meet Valentine! 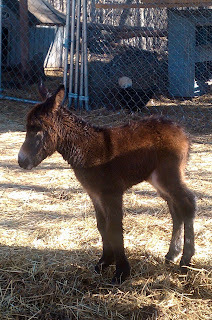 She was born during the night on Friday and was just waiting with her mom, Mini Pearl, a Mini Horse. Isn't she the cutest little Valentine you ever saw? Angela's Show & Tail. See you there...:) I'm bringing this little Valentine with me! My sis has mini horses and they are so tiny at birth. I have never seen a mini mule. ok JP...i admit. i'm still moving a little slow...it's early. on;y on my 2nd cup of coffee. VALENTINE is the cutest little thing i've seen in a long time!! i love mules...donkeys...(are they the same?! )...but MINI ones!! OH MY! love her!! I was beginning to type my comment, when I glanced at Laura K's - she had written the same thing I was going to say about Valentine! He is SOO sweet!! I can't imagine how tickled they are to have him added to the "family"! I didn't even know mini-mules existed! OMG i LOVE HER... soooo sweet i got excited thinking your visitor was there and you had a new resident on your wonderful homestead. i love donkeys and would have one if i had land to put it on. Holy Cow what a surprise to wake up to...and what a great name. Arn't animals wonderful, esp. babies. Mini anything is just adorable! Valentine..what a sweet name. WOW~! I can just feel his fur/hair.. These little guys are so cute... and soft.. I'll bet he will be fun to watch jumping, skipping and running like most animals do when they are babies. Cute~Cute~Cute~! What a wonderful surprise for your friend to wake up and find! Such a beautiful baby! I love the name Valentine too! What a sweet story! Oh my gosh cuteness!!! My goodness what a cute wonderful surprise!! Awe - that is absolutely so cute - you are so lucky to see things like this. Hope you had a nice valentines day! What an adorable baby! That is quite the surprise.